Automated imaging and objective diagnosis of excised tissue specimens during cancer surgery is a promising approach for increasing the efficiency of the most advanced surgical procedure. Firstly, this quantitative approach can increase the efficacy of surgery by eliminating the errors related to the subjective inter-observer evaluation of histopathological sections. Secondly, the multimodal spectral histopathology can be applied to tissue sections as well as tissue block, thus eliminating the timeconsuming procedures required for preparation of frozen sections required for histopathology. Basal Cell Carcinoma (BCC) constitutes about 75% of skin cancers with more than 60,000 new patients diagnosed each year in the UK. For aggressive BCCs, Mohs Micrographic Surgery (MMS) is considered the most suitable treatment. Its main disadvantage is the need for frozen section preparation and histopathology examination for all excised tissues, a non-automated, time-consuming technique. These drawbacks lead to an unequal healthcare provision in the UK . To reduce the data acquisition time and make molecular spectroscopy suitable for intra-operative use, a research team at the University of Nottingham has developed novel selective sampling techniques based on multimodal spectral imaging . The team first used tissue auto-fluorescence imaging, which has high sensitivity, high speed and low specificity, to determine the main spatial features of the sample. This information was then used in an automated manner to select and prioritize the sampling points for Raman spectroscopy. Figure 1: A schematic description of the instrument. The Raman spectra were recorded using a custom built Raman micro-spectrometer (Figure 1) based on an inverted optical microscope (Eclipse-Ti, Nikon) with a 50×/0.55 objective (Leica), 785 nm wavelength laser (Starbright XM, Torsana), spectrograph (77200, Newport/Oriel), back-illuminated deep-depletion CCD (DU401A-BR-DD, Andor Technology) and automated sample stage (H107 Proscan II, Prior Scientific). The wavelength of the excitation laser was selected to minimize the excitation of tissue auto-fluorescence. 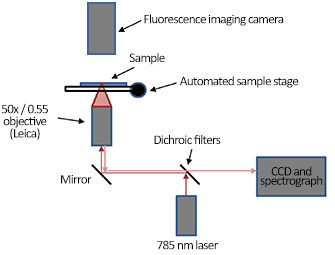 The auto-fluorescence images of tissue sections were measured using a wide-field fluorescence imaging system integrated into the Raman microscope; the system consisted of a mercury lamp (Nikon), CCD camera and fluorescence filters for collagen (Semrock, DAPI-5060C-NTE-ZERO) and tryptophan (Semrock FF310-Di01-25×36, FF01-292/ 27-25, FF01-357/ 44-25). A comparison between multimodal spectral imaging and raster-scanning Raman microscopy is presented in Figure 2. This sampling strategy makes it possible to obtain diagnostic accuracy similar to raster-scanning Raman spectroscopy but with a dramatic decrease in the number of Raman spectra and acquisition time. Accurate diagnosis can be obtained with only 500 - 1500 Raman spectra for skin samples of 1×1 cm2 obtained during Mohs surgery, both for tissue sections (Figure 3) and un-sectioned tissue blocks . For the laboratory-based prototype, the acquisition time for the auto-fluorescence images was 4 minutes, integration time for each Raman spectrum was 2 seconds, the image segmentation processing using a standard PC was 2 minutes. Using these figures, the diagnosis time by MSI can be estimated to 20 - 60 minutes, which even at this early stage is shorter than the frozen section histopathology currently used during MMS (1 - 2 hours). These results show the potential of multimodal spectral histopathology for diagnosis of tissues during cancer surgery. This provides a quick and objective way of telling whether the tissue layers removed by the surgeon are clear of tumour or not. National Institute for Health and Care Excellence (NICE) 2006, Report on Improving Outcomes for People with Skin Tumours including Melanoma. K. Kong, C.J. Rowlands, S. Varma, W. Perkins, I.H. Leach, A.A. Koloydenko, H.C. Williams and I. Notingher, Diagnosis of tumours during tissue conserving surgery with integrated auto- fluorescence and Raman scattering microscopy, PNAS 2013, 110 (38), 15189-15194.